The 45th Infantry Division Museum in Oklahoma City commemorates the World War II service of the Army’s much-decorated unit, the Thunderbirds. The 45th Infantry Division of the United States Army earned an impressive record during World War II. Originally formed from an Oklahoma National Guard unit, the division was rounded out by National Guard formations from Colorado, Arizona, and New Mexico. Nicknamed the “Thunderbirds” in reference to their distinctive unit patch, which depicted the bird of Native American legend, the unit endured over 500 days in combat. Many of those days were spent in such bloody locales as Sicily, Anzio, southern France, the Vosges Mountains, and the Rhineland. Today, a museum commemorates the service and sacrifice of the unit’s soldiers. 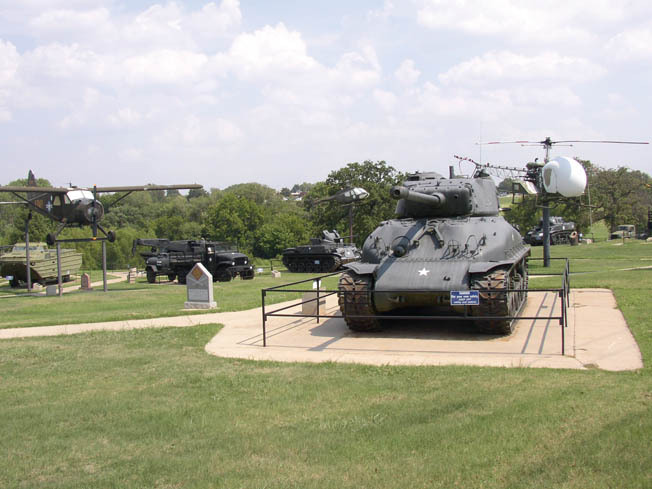 Located in northeastern Oklahoma City, Oklahoma, the 45th Infantry Division Museum is a short drive west on N.E. 36th Street from Interstate 35. Unlike the typical military museum, the 45th Division’s museum was built for and by National Guardsmen and other veterans of the unit. Many of the items on display were obtained from former Thunderbirds. The 45th Division Association, a veteran’s group, has been heavily involved in the museum from the start. 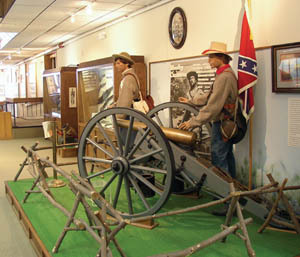 While the 45th Division is its prime focus, the museum also serves to memorialize Oklahoma’s overall military history. The National Guards of various states have helped the museum since its opening in 1976, donating various vehicles and artifacts. There is also a heavy Native American influence, in keeping with Oklahoma’s 19th-century origins as Indian Territory. The expansive 15 acre military vehicle park. On approaching the museum, visitors come upon a 15-acre military vehicle park. More than 60 tanks and armored vehicles, aircraft, and artillery pieces sit on display in the park. Included are such World War II vehicles as M4 Sherman tanks, an M8 75mm Gun Motor Carriage, and a DUKW “duck” amphibious truck, as well as Cold War-era Patton tanks and artillery. The aircraft are mounted on elevated pedestals and include a mix of Korean War and Vietnam-era helicopters and combat aircraft from the Oklahoma National Guard. A group of 105mm and 155mm howitzers guard the entrance to the museum itself. Looking downhill to the northeast, one can see an authentic section of a Bailey bridge crossing a small creek. This modular bridge design became famous during World War II for the relative ease with which it could be assembled for river crossings. The bridge was donated by the Missouri National Guard. Delivery to the museum was delayed when the bridge had to be used during a flood. A small entryway leads into the museum. Immediately to the left is an information desk often manned by division veterans who volunteer their time. The building itself was once the headquarters of the division during the 1930s. It is a classic local edifice of reddish stone with dark wood paneling in its interior. The mood is somber and quiet, with the impression of hallowed memories and hard-won achievements preserved for posterity. The first display is a long row of glass cases highlighting Oklahoma’s early military history, with particular attention paid to the Civil War and Indian wars. The display includes a number of original weapons and pieces of uniforms and equipment from the era. World War I is commemorated with a number of displays and a life-size diorama of a trench scene complete with mannequins. Attention is also given to the interwar period, showing the Thunderbird’s pre-World War II heritage. The division’s most famous period of service, World War II, gives rise to the museum’s most fascinating exhibits. 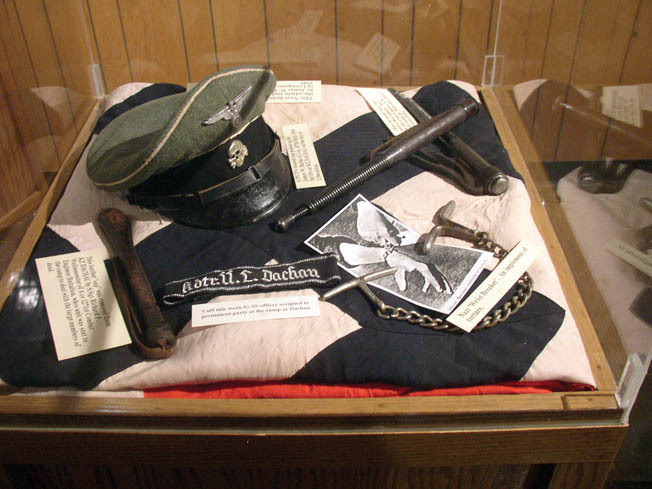 Prominently displayed are a variety of items taken from Nazi leader Adolf Hitler’s personal apartment in Munich, “liberated” by the Thunderbirds when they captured the city in spring 1945. All visitors can look at their reflections in Hitler’s own mirror, taken as a spoil of war from the Führer’s Berlin bunker by an Oklahoma soldier. Also on display are sets of Hitler’s linens, towels, silverware, glasses, and pictures. One of his copies of Mein Kampf, complete with a wooden storage box, sits near a photograph of a Thunderbird soldier relaxing on Hitler’s bed. The soldier is reading a different copy of the famous book. Nearby cases hold a variety of American, German, and Italian weapons, uniforms, insignia, and souvenirs, signifying the unit’s service in every part of the European Theater, from Sicily to Germany. Across a small hallway from the Hitler display is a room dedicated to the works of Bill Mauldin, the artist whose mordantly humorous Willie and Joe cartoons appeared in Stars and Stripes to the delight of millions of GIs. Mauldin, who went to pains to depict the life of the common soldier, made an enemy of General Patton with his realistic portrayals of the mud and privation the frontline infantryman experienced in World War II. Patton disliked the shabby appearance of Mauldin’s two hapless GIs and tried to browbeat the young Mauldin into changing his style. Undaunted, the cartoonist continued to draw the war as he saw it, with his own brand of humor. Mauldin was a member of the 45th Division early in the war, and Thunderbird patches can be seen on the shoulders of many of the soldiers in his drawings. The museum’s collection contains some 200 of the artist’s original drawings. A group of Thunderbird veterans collaborated to buy the collection from a New York art dealer. Many of the sketches contain notes and comments in the margins as well as small corrections made during the creative process. The room is well lit and organized, conveying the feel of a shrine to three of World War II’s most iconic figures: Mauldin, Willie and Joe. A small sampling of the authentic Nazi paraphernalia in the Dachau room. The Dachau room, by contrast, provides a stark example of both the war’s cost and the need to fight it. The 157th Regiment of the division liberated the camp on April 29, 1945, revealing to them the full horror of the Nazi concentration camp system: a train stacked with thousands of bodies, the prisoners’ area filled with living but emaciated human beings, and more stacks of rail-thin corpses outside the camp’s crematorium. Drawings made by inmates adorn the museum walls next to photographs of the liberation of the camp and U.S. Army documents relating to the 157th’s role in that grim mission. There has been a long-standing argument between the 45th and 42nd Divisions over which actually liberated the camp. To defend the 45th Division’s claim, documents are posted detailing the camp’s location within the 45th’s zone of responsibility. A videotape interview of the senior officer present that day, Lt. Col. Felix Sparks, details what the Thunderbird soldiers saw at first. Sparks later rose to the rank of brigadier general in the Colorado National Guard. The Thunderbird’s next tour of duty was in the hills and mountains of Korea. The 45th was one of two National Guard divisions deployed to the embattled Asian country. Called to duty September 1, 1950, the unit arrived in Japan in April 1951, training there before relieving the 1st Cavalry Division in Korea that December. The Thunderbirds fought in four campaigns during the war before the armistice in July 1953. The museum displays memorabilia, photographs, and several captured Communist weapons, including a Chinese copy of the Soviet PPsh41 submachine gun. Visitors can handle the weapon used by the Thunderbirds’ opponents during the conflict. Although the Reaves Military Weapons Collection is not directly connected to the 45th Division, anyone interested in military small arms will enjoy it. Jordan Reaves began collecting Civil War-era weapons in the 1950s and continued for the next 30 years, eventually amassing a huge collection that spans from the American Revolution through the Vietnam War. This includes a number of captured enemy weapons, mortars, and cannons. Uniform displays dot the exhibit, matching original equipment to the weaponry. Authentic Mosby Cannon is a popular exhibit amongst Civil-War aficionados. The most famous weapon in the collection is the Mosby Cannon, one of the best-documented artillery pieces of the Civil War. The gun was used by the 43rd Battalion, Virginia Cavalry, also known as Mosby’s Rangers. During the Battle of Catlett’s Station in May 1863, the gun was captured by Union troops, possibly the 5th New York Cavalry, and sent north. There it sat in the hands of private collectors until the late 1950s, when it was acquired by an antique dealer in Dallas. Reaves bought the gun in 1960 and donated it to the museum along with the rest of his collection. While the museum has relatively little coverage of the Civil War, the enormous number of period firearms on display in the Reaves collection alone justifies a visit by students of that conflict. Behind the Reaves Collection is another hall dedicated to the Service Forces, those unsung soldiers who supported and supplied the more glamorous combat troops. The hall boasts several displays of tents, jeeps, light trucks, bivouac equipment, and other unspectacular but necessary impedimenta of war. While not as exciting as the tanks, guns, and aircraft, the display provides a close-hand look at the engineering, labor, and organization that kept the soldiers and their weapons functioning in wartime. The 45th had more than its fair share of heroes, and one room of the museum is dedicated to those Thunderbirds who won America’s highest award, the Medal of Honor. Each is recognized by a photograph and plaque citing the reason for the award. Below each is a diorama of the event itself. Of particular note is the story of 2nd Lt. Ernest Childers, the first Thunderbird to win the award in World War II and the first Native American in history to do so. A former first sergeant with the 45th’s Company C, 180th Infantry Regiment, Childers had received a battlefield commission just before the unit began its part in the Salerno operation in southern Italy. Early in the morning of September 22, 1943, Childers was leading a patrol on an attack against a cemetery held by German troops. Wounded in the foot and in pain, he nevertheless continued forward on his hands and knees. Two snipers and three German machine gun nests fell to him and his men that day. One of them was hastily evacuated when Childers threw a rock into it. Mistaking it for a grenade, the German soldiers jumped out of their position, enabling Childers to shoot them and put the gun out of action. Completing the museum’s interior is a chapel: small but well appointed, with a stained-glass window depicting a Thunderbird holding a Bible and an M1 Garand rifle. A few rows of pews allow visitors to sit and reflect on the accomplishments and sacrifices of the 45th Division. Rounding out the museum is a small gift shop, picnic area, and a monument bearing the Thunderbird symbol. Formerly placed in downtown Oklahoma City, the 40-foot-high tribute was moved to the museum after it became dwarfed by the growing skyscrapers of the city. Future plans include an exhibit on Oklahoma’s contributions to the ongoing global war on terror. The museum is open Tuesday through Friday from 9 am to 4:15 pm (10 to 4:15 on Saturday, 1 to 4:15 on Sunday). For more information, write: 45th Division Museum, 2145 N.E. 36th St, Oklahoma City, OK 73111, or visit www.45thdivisionmuseum.com. Tags 45th Infantry Division, 45th Infantry Division Museum, Bill Mauldin, civil war, DUKW, Ernest Childers, Indian Wars, Korean War, medal of honor, Mosby Cannon, Reaves Military Weapons Collection, World War I, WWII.